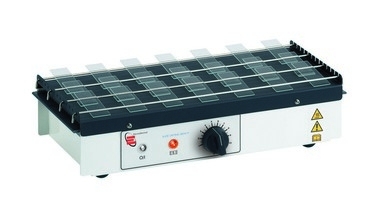 This Slide Drying Bench aids the preparation of microscope slides at the specimen mounting stage. Accepting up to 50 slides, it has the facility for drying slides in different orientations. Clear to indicate "Power On" and Amber to indicate "Heater On"
Built-in energy regulator controlling temperature up to 100C.